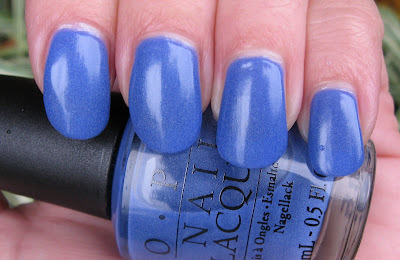 Above & Below: OPI Glow-Ink The Dark is a beautiful shade of cornflower blue that applied very nicely, although it took 4 coats! I should say it finished nicely because I love the final look, in spite of having to use 4 coats. Below: A bad quality photo of the 'glow'. 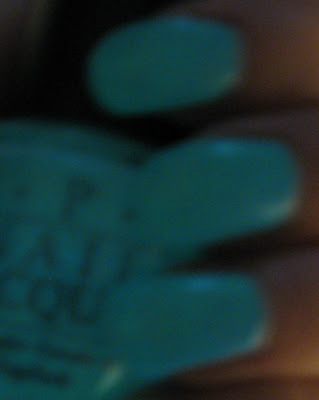 Glow-Ink The Dark is a relatively new offering from OPI for Halloween 2009. It can also be found in their 4 piece mini set called Tattoo Ta-Boo. I'm not exactly sure why I bought this, perhaps for the novelty of the glow in the dark idea. It's a very pretty shade of cornflower blue with very fine shimmer, which is actually the glow in the dark material, a phosphorescent pigment. It finishes with a semi-matte or eggshell loo, but a satiny finish is sometimes a nice change from the total mattes or glossies we've gotten used to. The formula dries quickly, but applies very thin, as this look took 4 coats. I imagine putting a clear coat over it would diminish the glow factor significantly, but because it's so thin, using a coat of it over another color would work fine for a bit of 'glow'. It would also work well using it as a Konad stamping polish, especially if they make a Halloween plate (which I'm not sure of). It does glow a nice greenish color, but I wasn't able to photograph it very well, unfortunately. Great glow in the dark shot, I tried to do that once and it didn't work out nearly as well! How pretty you look in this. Yours is the nicest picture I've seen of this polish. It's such a lovely color with a bonus of a glow! I have a whole bottle of China Glaze glow in the dark. I believe it came in a kit last year. I've never tried it alone, I think it's just white. Hey Mary!I'm totally into the glow in the dark polishes I have China Glaze Ghoolish Glow and it's one of these top coats which is fun wearing.But this is something else, I love the colour and the effect of those particles it has to glow! Do you know where I can find a bottle of this online?I can't seem to find it in any online store which ships internationally. Polished Museaholic~thank you, it turned out better than I thought it would :) That's a little high, I agree. Brooke~I won't even tell you how many pictures I took to get even that bad one! It is an unusual choice of color for Halloween. KONADomania~thank you. It has such a smooth finish and even though it was thin, it applied really well. Diana~looking forward to seeing your Halloween plate designs! Katie~I love the finished look of this with the little particles! I'm not sure where to get it from that ships Intl. I'll do some checking and let you know if I find any place that does. Nail Fanatic~I didn't realize the little shimmers would show up as well as they do. It reminds me of the Suedes, only a bit shinier. Krisprimps~It looked good in the view finder, but then they kept coming out black no matter what settings I was using. I guess I should be thankful I got one that showed up at all! omg thats well cool !! !